One of the central themes of my book is that one of the key drivers for adoption is economics. This means that once there is sufficient availability of models in the right price brackets the clear market for early adopters is the owner of vehicles that do many more kilometres than the average car. This is because the higher fixed cost of an electric vehicle can be amortised over many more kilometres, and their fuel and maintenance costs are much higher than the average user, which means greater savings from an electric vehicle. This means taxi operators and people doing significant mileage for ride-sharing companies like Lyft and Uber and Ola. It also applies to delivery vans which I will deal with in a separate post. This group is also more brand agnostic. The majority market of new car buyers contains a lot of people who have a long history with a particular brand or model of vehicle. Taxi companies and ride share car owners are likely to be less tied to a particular brand or model because theirs is primarily a business decision. This will be reinforced if the ride-share companies act as an aggregator of electric vehicle and finance demand for their drivers. If the ride-share companies aggregate demand, they should be able to get better prices from the manufacturers. The manufacturers will be keen to supply vehicles to these drivers via a ride-sharing company deal because they will act as mobile car dealers for them by exposing many more people to their car of choice. This is an ideal marketing situation, selling your customers a product at a profit which can then be used as a marketing tool. The ride share companies could also create a market through financing plans that match driver mileages, providing lower interest cost leases, and even aggregating demand for rooftop solar panel models that reduce motoring costs. There is a huge incentive for the ride sharing companies to help their drivers in this way because it will cost them very little (and they may make a small profit) but helps their drivers and their loyalty. Models may emerge tying opportunities to how many kilometres that drivers travel, or discounts on leases once a certain mileage is achieved This would help tie drivers to a single provider rather than swapping between them. Of course, as running costs reduce because of these vehicles we would also expect the ride sharing companies put the squeeze on the amount of money they pay to drivers but in the short terms drivers of electric vehicles will make more money than the drivers of equivalent fossil fuel cars. We are already seeing financial models for taxis that are taking advantage of these differences by building lease systems that demonstrate the overall cost savings of leasing a new electric vehicle. This means rather than having to stump up extra capital for purchase the lease has immediate improvements in cash flow. These include LEVC which offer a lease based on just over 48,000 km a year and London Electric Taxi Leasing that offer one-year leases with unlimited mileage with a monthly charge using the same vehicles. 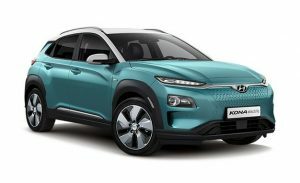 These vehicles claim a range of 600km so charging the battery three times a week to 80% of capacity once it gets to 20% of capacity would give over 50,000 km of driving a year. The savings will vary. If we take the Chevy Bolt as an example vehicle costs then we can generate the following models. 18.235 c/kwh – the lowest current cost shoulder and off-peak cost on my network. Applies at all times except 3pm-9pm. Solar feed in tariff is 10 cents. 10 c/kwh – feed in tariff for lowest power price I can get. 14.5 cents – average power price for me on 18.235 power price and 10 cents solar feed in tariff assuming a mix of solar and off-peak tariff for charging. 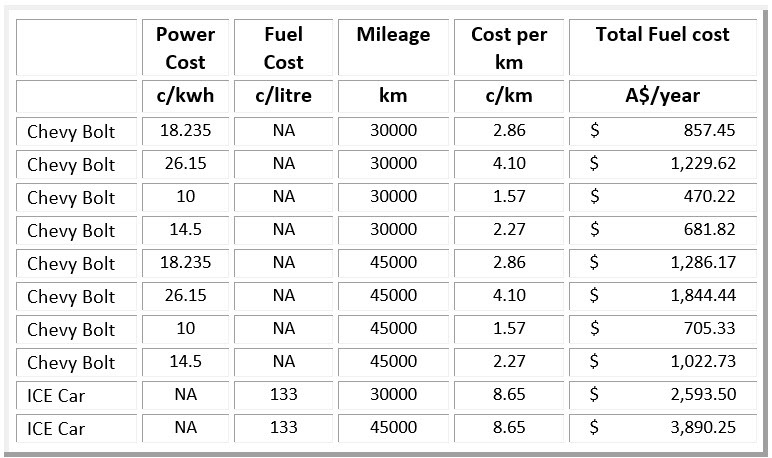 ICE car costs are calculated at 6.5L per 100km which a fairly efficient petrol vehicle for a small to mid-sized vehicle. So if I have a mid-sized ICE vehicle and am driving it 45,000 km a year as a ride sharing vehicle then I can save somewhere between $2,000 and $3,000 a year on fuel costs depending on my mix of electricity sources. Driving 45,000km is roughly an extra 600 km a week on top of normal car mileage so it would require me to drive 120km a day 5 days a week as a ride share vehicle. If we add in a difference of 4c a km in repairs and maintenance over 5 years or 220,000km , then I can be up to $4,800 a year better off if charging my battery at the lowest rates. More likely this figure will be around $4,500 but is still a significant cost saving. Of course, car value also depends on the re-sale value and we have yet to establish a solid re-sale market for electric cars so this is hard to calculate. It is my belief that the re-sale market will be of more value in the future than for ICE vehicles (see chapter TK adoption scenario consequences) as fossil fuel second hand cars fall in value and the reduced costs of electric vehicle make them more valuable. If we assume like for like the it is not unreasonable for someone to pay $10,000 more for an electric vehicle in this situation. Spread over 5 years that is $2,000 a year plus the cost of money so a reasonable return can be gained from such a decision. Of course that is much easier to see in a leasing model as opposed to a purchase model. The week that I was writing the first draft of this chapter was heading to Queensland for work I took an Uber vehicle to the airport. I questioned my driver as to whether he had thought about an electric vehicle. He responded that he had not, and he would not. When I asked him why he said he had a 1967 Mustang in the garage at home and he was an absolute petrol head so he wouldn’t be buying an electric car ever. In the ten-minute journey he changed his mind. We worked through the operating costs for his vehicle, the fact that he was driving 50,000 km a year in that vehicle, and his solar feed in rate at home. We calculated he would save about $4,500 a year in operating costs over 5 years and he could still feed his inner petrol head by driving his Mustang on the 45 days he was allowed to drive it as a club registered vehicle. While this is anecdotal and cannot be extended across the market it is typical of the responses I get when I ask these questions. Not sure if it improves or reduces my overall Uber rating! The other less economic model for the is the use of the batteries in electric cars as storage for household use, particularly in higher energy costs areas. I have previously written that it is currently hard to make economic sense of battery storage in Victoria where I live. However, if you are buying the car anyway the household storage value essentially comes for no capital cost unless the system to run it is more expensive. An opportunity exists for electric vehicles with bidirectional charging for certain user profiles for use as grid type storage. A high differential between current energy costs and solar energy feed in tariffs for house owners with solar roof panels installed. A high differential between off peak and peak energy charges. Households where the electric vehicle is parked at home for large periods of time during peak solar production times. This could include two car families where the second car is driven to the work or to a railway station during the day and the second vehicle is mainly parked at home. Regional areas where the feed in levels for solar energy are capped. Which means that any extra energy from a solar system is completely wasted. I was contacted by several people who have tis situation in response to my article in the Age. Households in low reliability network areas, especially those with exposure to increasing levels of storm damage due to climate change. The new Nissan Leaf will have bi-directional charging when they hit the Australian market. In theory, they could be used as household storage. When I modelled the numbers we were surprised to find that the cost advantages were not that great. The detailed numbers will be published in the book but the summary is that the majority of use cases would have a cost saving of about $190 a year. There are individual cases where this number is greater. They are also described in the book. Therefore my view is that vast majority of people are unlikely to make a purchase based on household storage reasons although it may be an added incentive once people have come down to a choice of a couple of vehicles. However it may be that the cost of the system is not that high and therefore it may become a feature of more and more vehicles over time, especially if market research indicates that not having the feature is causing people not to buy a particular vehicle. Extending the use, if not the buying decisions that influence the adoption curve.